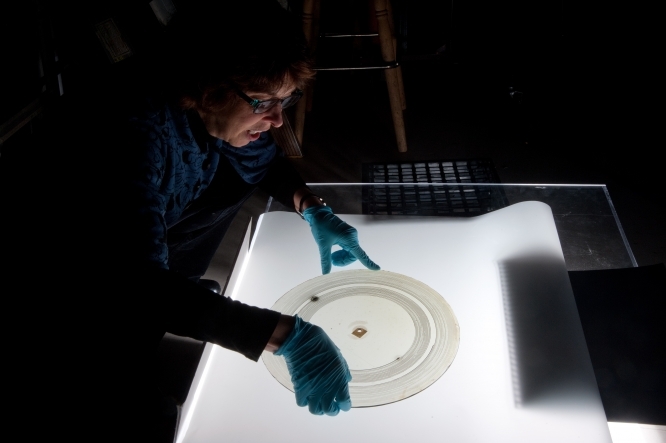 Five years later, Berkeley physicist Carl Haber received the MacArthur “Genius Grant” for doing just this–moving two- or three-dimensional audio recordings on obsolete platforms and/or decaying storage media and digitally restoring them. These long-lost analog sounds can essentially be played with a virtual needle. A disc or cylinder is placed in a precision optical metrology system, where a camera following the path of the grooves on the object takes thousands of images that are then cleaned to compensate for physical damage; the resulting data are mathematically interpolated to determine how a stylus would course through the undulations, and the stylus motion is converted into a standard digital sound file. So IRENE uses image processing to take a picture and mathematically break down the information in that image to calculate the motion of the groove and determine what sound would actually be played. It’s all done with an algorithm on a computer, never having to touch the recording in the process. Early experimental recordings are not the only recovered lost voices. Anthropologists, linguists and ethnographers were among some of the first to use recording as a research tool and to document cultural heritage. IRENE has restored some of these field recordings, including wax cylinders from the Alfred L. Kroeber collection at the Phoebe A. Hearst Museum of Anthropology in Berkeley. There are over 3,000 cylinder recordings in the collection that document California Native American culture from 01900-01919. Around 300 of these cylinders are 2-3 minute long recordings of Ishi, the only surviving member of the Yahi at the time. 53 of the 300 cylinders are Ishi telling the story of the “Wood Duck” in 01912. Digitization of these materials within the NAA (National Anthropological Archives) will give both scholars and local communities new access to documentation of endangered languages and cultural knowledge about threatened environments around the world, ranging from southern California to small Micronesian atolls. In September 02010, The Library of Congress released the first comprehensive study on a national level examining the preservation of sound recordings in the United States. It found that many historical recordings have already deteriorated or are inaccessible to the public due to their experimental and fragile nature. But maybe this is not the case after all. Perhaps Haber has taken upon an archaeological endeavor that postpones the detonation of media “time bombs.” It comes back to Kevin Kelly’s idea of movage. Haber has taken big technological steps to digitally play these long-lost analog voices, now the key is to keep on moving.